The Introduction to AWS EKS course is designed to aid and equip those, with a basic understanding of web-based software development, to know how to quickly launch a new EKS Kubernetes cluster and deploy, manage and measure its attributes. In this course, you will learn how to utilize a range of new skills from, understanding how EKS implements and deploys clusters into a VPC and leverages ELBs to expose Kubernetes services, to gaining the ability to use, control, manage and measure an EKS Kubernetes cluster deployed application. This course is made up of 4 in-depth demonstrations that, at the end of the course, will enable you to deploy an end-to-end microservices web-based application into an EKS Kubernetes cluster. Understand the basic principles involved with launching an EKS Kubernetes cluster. Analyze how to set up the required EKS client-side tooling required to launch and administer an EKS Kubernetes cluster. Learn how to use the eksctl tool to create, query, and delete an EKS Kubernetes cluster. Follow basic kubectl commands to create, query, and delete Kubernetes Pods and Services. Explain how EKS implements and deploys cluster into a VPC and leverages ELBs to expose Kubernetes services. Learn how to author and structure K8s definition files using YAML. Gain experience in how to deploy an end-to-end microservices based web application into an EKS Kubernetes cluster. Be able to use, control, manage and measure an EKS Kubernetes cluster deployed application. High-level understanding of web-based software development. Knowledge of Docker and Containers. Prior experience in microservice architectures. Container and Microservices Administrators and Developers. Cloud System Administrators and/or Operations. Hello and welcome to this Cloud Academy course on Amazon EKS. In this first lecture, we'll cover off the course agenda, intended audience, learning objectives, and course prerequisites. Before we start, I would like to introduce myself. 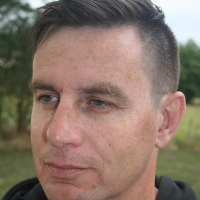 My name is Jeremy Cook, I'm one of the trainers here at Cloud Academy, specializing in AWS and DevOps. Feel free to connect either with myself or the wider team here at Cloud Academy regarding anything about his course. You can email either myself and/or the Could Academy team at support@cloudacademy.com. This training course introduces you to Amazon's Elastic Container Service for Kubernetes, or, Amazon EKS. EKS is a managed service offering for Kubernetes allowing you to quickly deploy and set up Kubernetes clusters. With EKS, Amazon takes care of provisioning and running the Kubernetes management infrastructure in what's referred to as the control plane. You, the AWS account owner, only need to provision and maintain the worker notes. More on this later. As we move through the course, we'll provide several hands-on demonstrations where we use Amazon EKS from both the web console and from the command line ensuring that you become familiarized with the entire EKS managed service and how to administer it. We'll demonstrate features such as: One, Installing and Configuring required command line tools. Two, Creating a new EKS Cluster from scratch. Three, EKS Cluster security for managing authentication and authorization. Four, launching Kubernetes Pods and Services. Five, Deploying an end to end sample ecommerce microservices based application. Six, Networking demonstrations where we measure load and performance. And seven, tearing down and cleaning up EKS cluster resources. The intended audience for this course includes software developers, container and microservices administrators and developers, and cloud system administrators and/or operations. By completing this course, you will understand the basic principles involved with launching an EKS Kubernetes cluster, understand how to set up the required EKS client side tooling required to launch and administer an EKS Kubernetes cluster, understand how to use the eksctl tool to create, query, and delete EKS Kubernetes cluster resources, understand basic kubectl commands to create, query, and delete Kubernetes Pods and Services, understand how EKS implements and deploys cluster resources into a VPC and leverages ELBs to expose Kubernetes services, understand how to author and structure Kubernetes definition files using YAML, understand how to deploy an end-to-end microservices based web application into a EKS Kubernetes cluster, be able to use, control, manage and measure an EKS Kubernetes cluster deployed application, and finally, be able to tear down and clean up an existing EKS Kubernetes cluster ensuring all resources are removed and deleted in the right sequence. The agenda for the remainder of this course is as follows. We'll introduce you to the required client side tooling required to launch and authenticate against an EKS cluster. We'll then proceed by launching an EKS cluster and authenticating against it using IAM credentials and permissions. We'll then deploy and end-to-end microservices based web ecommerce store which will leverage Kubernetes Deployments, Services, and Service Discovery. We'll then perform load testing and performance measurements of our EKS cluster hosted application. And finally, we'll perform a full tear down and clean up all Kubernetes cluster resources. 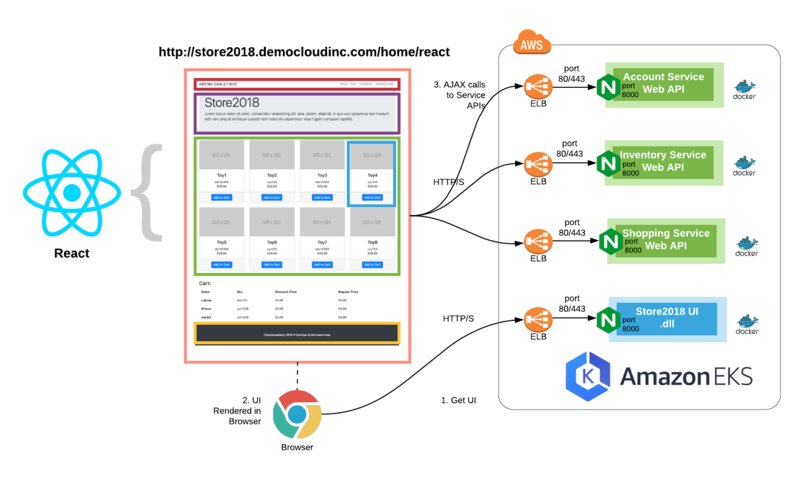 As already mentioned, as we work through each of the EKS hands-on demonstrations, we'll eventually deploy a sample microservices architected ecommerce application. The microservices architecture that we deploy will examine two different designs differentiated mainly by rendering techniques for the user interface. As per the diagram shown here, the first method uses Serverside ASP.Net Razor Templates with backend synchronous API calling. The second method utilizes React on the front end to perform client side rendering, and accommodates AJAX calls being made from the browser directly to the backend APIs. The following prerequisites will be both useful and helpful for this course. A basic understanding of web based software development, A basic understanding of Docker and Containers in general, and finally, a basic understanding of microservice architectures. Okay. The course introduction has now been completed. Go ahead and close this lecture and we'll see you shortly in the next one.